SkyTrain images by Andreas Wiese, aerial images by Ansgar M. van Treeck. 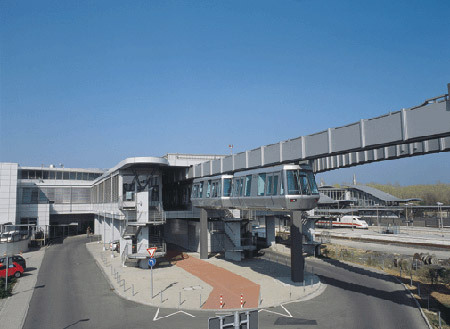 Siemens debuted its second H-Bahn monorail system in 2002 with the opening of the Düsseldorf Airport SkyTrain system. The 2.5 km system is also the first dual guideway H-Bahn built by the company. 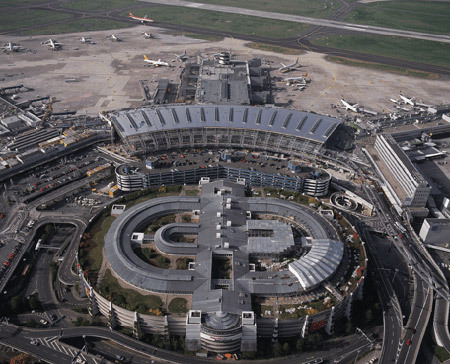 The SkyTrain operates between a new Düsseldorf Airport Rail Station, a parking lot structure and a brand new terminal at the airport. The trip from the rail station to the terminal takes about five minutes. This is an aerial view of the new rail station and the connecting SkyTrain station. Local trains as well as ICE high speed rail trains stop at the station. While it might look like it, this is not a terminal station for non-monorail lines. Rail lines enter a tunnel to run below the approach end of one of the runways. Passengers have plenty of room for their baggage on the short monorail trip to and from the airport terminal. Some airlines even allow check-in at the rail station, eliminating the need to bring luggage to the terminal. 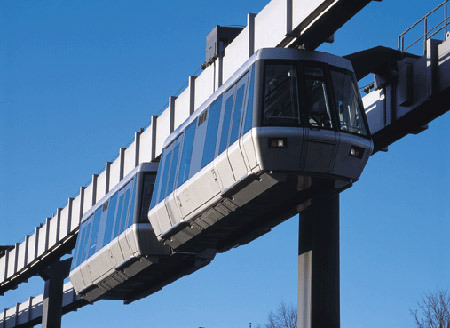 Here we see one of the SkyTrain trains departing the rail station. In the distance is one of the popular ICE high speed rail trains. 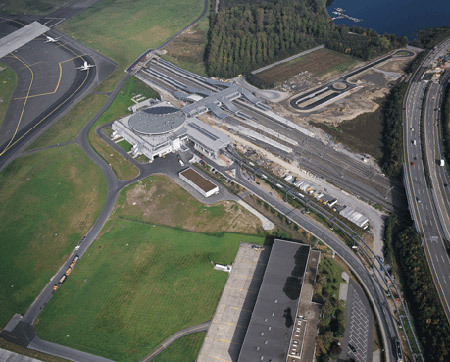 This aerial view shows the SkyTrain guideway approaching from the lower right and entering the new airport terminal building. The monorail system and airport terminal have been design for further expansion if needed in the future. 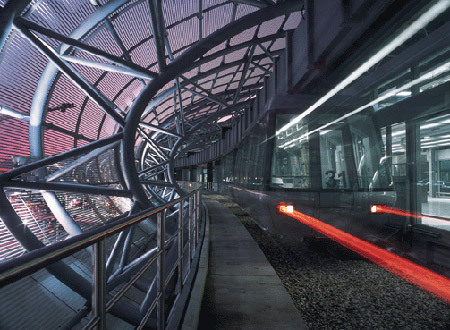 This artsy shot shows car 31 cruising along inside the new terminal, which was designed specially to hold the monorail. The system operates between 3:45 AM and 12:45 AM. 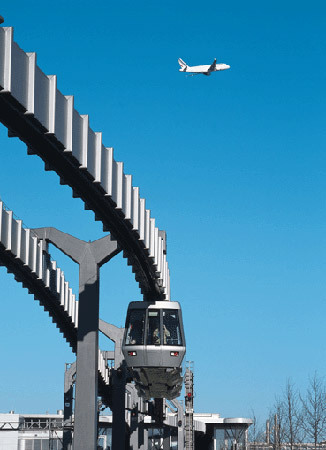 More information on Siemens H-Bahn technology can be found in the Monorail Society Technical Pages.